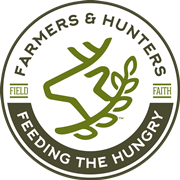 Stories & Testimonies - Farmers and Hunters Feeding the Hungry - Hunt Down Hunger! An article about the impact of meat donations from FHFH to Bona Vista, an organization providing services to many children and adults in their community, was featured in the Kokomo Perspective on January 2, 2019. CLICK HERE​ to read the full article. 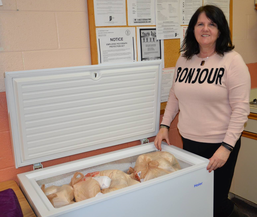 Last year, the North Central Indiana FHFH chapter donated the processed meat from six deer to Bona Vista’s to distribute to those who live in their group homes and supported living homes. This year, North Central Indiana FHFH donated meat from eight deer! "Thanks for the donation of meat. Our clients love deer meet!" On behalf of the Kokomo Rescue Mission and those we serve, I want to thank you for the generous donation of food. I can assure you that your donation went to feed the hungry and homeless through the Kokomo Rescue Mission dining room. Your donation included three deer and the processing fees for three deer. There are so many people who come to the Mission daily who are hungry and your donation enables us to serve them nutritious meals. It is because of your generosity and faithfulness in donating that this ministry is able to continue to share, help and provide to those who are struggling. Again, thank you for helping support the Mission's vision. Thank you so much for helping feed the hungry! May God continue to bless you! Thank you so much for your assistance in paying for the processing of the 4-H steer we purchased at the Porter Country Fair. We purchased the dairy steer with money from a Boone Township Buyers Group. It was wonderful to have money to process this animal, grinding it into hamburger for easy and fair distribution to our clients. Our clients are very grateful for this wonderful meat. Hebron is a small town in Northwest Indiana. There is a great deal of need in the town. According to the latest census, 14% of our residents live at the poverty level. 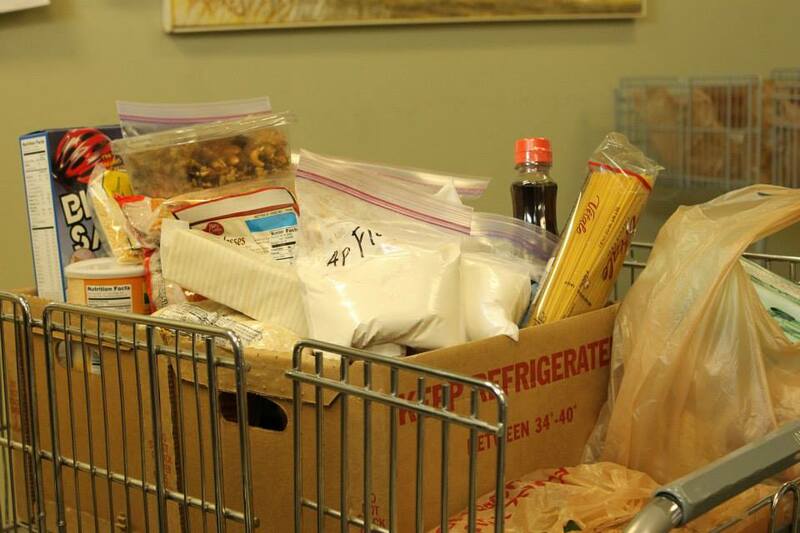 Our pantry serves an average 125 families a month. We are very blessed to have the support of the school, business, and many individuals in our community. We would not be able to accomplish what we do without the help of so many. We are very grateful for the help your organization has given us. We have also received venison through your organization. Venison is very well received by our clients. Our clientele is made up of single mothers (many working 29 hours a week), large families, senior citizens and persons with disabilities. Many tell us often that they don’t know what they would do without our assistance. We love seeing happy faces! Our Texas Hill Country Chapter was able to bless the Fredericksburg Food Pantry with a load of nutritious deer meat last season with more to come this year! Meat donated through Lehigh Valley FHFH was picked up at Lehigh Valley Meats by Everlasting Life to help feed the hungry. 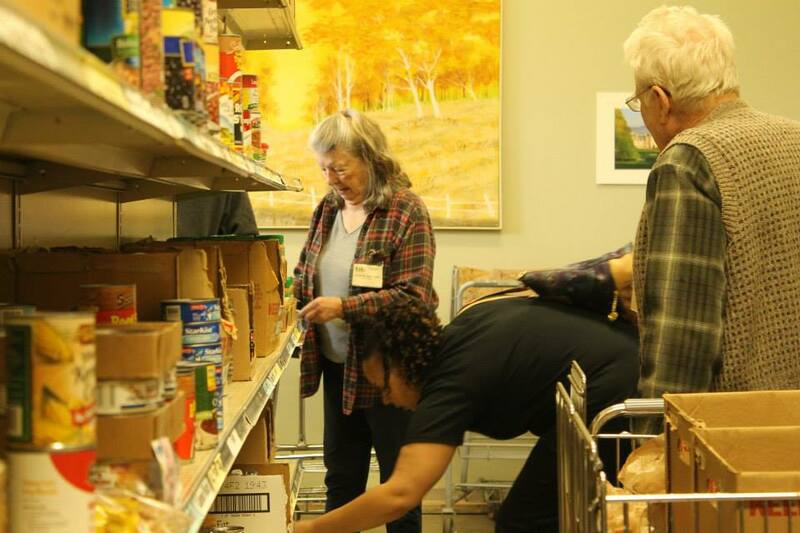 The mission of the Wooster Hope Center is to provide groceries, clothing, hygiene products, diapers, and haircuts in an effort to show love to their neighbors in the community that may be in need of some assistance. They also provide information about other services in their community that can help families who are facing economic challenges. Their ultimate goal is to unite people and resources in a community-wide effort to MAKE A DIFFERENCE and PROVIDE HOPE in all our lives. Hebron Country Pantry is a USDA Client Chose Pantry serving the Hebron community. We are presently open the first and third Mondays each month from 9:00-10:00 a.m. and 6:00-7:00 p.m. We serve approximately 80 families a month. We are housed in the lower level of the Hebron United Methodist Church. We have strong community support from individuals, schools, businesses, and organizations. The Boone Township Buyers Group recently purchased a dairy steer at the Porter County Fair to be donated to the Hebron Country Pantry. It was processed by the Butcher Block in Lowell, Indiana. We appreciate very much your assistance with the processing fee. The past fall we were also blessed with venison through your organization. This was very well received and appreciated by our clients. Thank you very much for all you do. Guernsey County FHFH in Ohio is making a difference to those in need and.was featured in a news article in the Daily Jeffersonian. Kathi Albertson is Chapter Coordinator for Guernsey County FHFH. Her Chapter donated more than 50 deer during the past hunting season to those in need in Guernsey, Noble and Harrison County in Ohio. The 50 deer provided 2,500 pounds of venison (10,000 servings) to food banks in the area. CLICK HERE to read the news article written by Rick Stillion, The Daily Jeffersonian. Thanks to the tremendous effort of FHFH, the Frederick Community Action Agency was able to provide 800 families a month with fresh meat to feed their families. Our families were especially grateful because we were able to provide healthy meat choice to them daily. We also were able to use some of the venison in our soup kitchen and provide lean, vitamin enriched meat to our homeless in Frederick County who need it the most. We feed anywhere from 80-130 individuals a night in our soup kitchen and with the wide variety of cuts we were able to provide a multitude of meal choices throughout the winter. Farmers and Hunters Feeding the Hungry reached out to us in 2016 and has been a significant partner for our protein supply in 2016. As the Executive Chef, I am grateful for the partnership and steady supply of high-quality proteins to our guests. Miriam’s Kitchen is committed to ending chronic homelessness in DC by creating meaningful connections with chronically homeless individuals, placing them in permanent supportive housing, and ensuring they have the necessary support to remain in housing. We advocate for permanent supportive housing as a long-term solution, while meeting short-term needs by providing healthy meals and high quality social services to more than 2,500 chronically homeless individuals each week. We use about two hundred pounds of meat a week at our operation, all of which comes from donations. If we could continue to have a consistent supply of venison to help offset this large need, it would benefit our guests and the organization greatly. The chef team at Miriam’s Kitchen would be happy to continue to use any and all venison donations we could get from FHFH. The work they are doing not only benefits those who are most in need of the dignity of a restaurant-quality meal, but also betters the environment and DC community at large. Thanks to Metroparks of the Toledo Area and Farmers and Hunters Feeding the Hungry for their donation of nearly 10,000 POUNDS of venison! Our Head Chef Kary Jo made Venison Shepard's Pie for dinner last night, and our guests were able to enjoy a delicious meal because of your generosity. The North Georgia Foothills chapter of Farmers and Hunters Feeding the Hungry made its annual meat donation to the local Abba House food ministry located in Dawsonville. Throughout the fall, hunters in Dawson, Forsyth, Lumpkin and Hall counties donate harvested deer for processing. The venison is processed and divided into two pound packs by Southers Deer Cooler of Murrayville. This year Joe Schuster, Chapter Coordinator for North Georgia Foothills FHFH, delivered 200 pounds of protein rich meat to Jennifer Rabun, Director of the Food Ministry at Abba House. 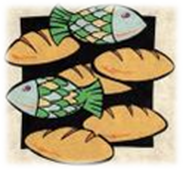 "We are so grateful for groups like FHFH to help with our food needs. We'd like to thank all of the hunters that donated deer this season to help with our shelter." There are several reasons why receiving deer meat is essential to Hoosier Hills Food Bank. We serve 6 counties in South Central Indiana, over 100 member agencies that serve over 26,000 individuals each year. In total HHFB provides about 14,000 meals on any given day. Unfortunately, finding protein to go with the meals and distributions is a real challenge. In our community we often hear about local foods, healthy local foods and what better source of healthy protein than freshly harvested deer meat. Normally when we receive a donation from KW Deer Processing the product is gone within hours. Places like Indiana Indian Movement in Lawrence County depend on donations like this because it might be the only meat they get for weeks at a time. For that reason we are so appreciative of the partnership with Farmers and Hunters Feeding the Hungry and we look forward to growing this partnership in the future. We have fed more families than I can remember. It started out with 4 families who I knew personally. All of them large families. I gave all that meat out to these families, then you gave me more. his kids in the car and I was overwhelmed because I knew if he had money those babies wouldn't eat because he would blow it getting high, but if he had meat then the kids would eat. I gave them 30 lbs. of burger. Another lady has 4 teens, but adopted her sister's kids so she added 4 more kids to her 4. Now it's a family of 10. Both mom and dad work, but struggle. We filled their freezer with 50 lbs. of burger and they were so grateful! A lady had just had knee replacement. It's just her and she needed a little help. I gave her 20 lbs. A widow with a 19 year old son lost her husband in June. I gave 20 lbs. of burger to them. It was crazy because he was a hunter and he always filled the freezer with deer every year. We have fed several others with 5 lbs. here and there. It's been awesome. I think we have around 40-50 lbs. left that we will use in the soup kitchen. Thank you so much for the meat. It was such a blessing. Helping feed the hunger in people is always worthwhile and you will truly be blessed for that. ​We appreciate all of you. First Baptist Church food pantry was so thankful to receive your generous donation. Having frozen meat on hand allows us to meet the needs of those being served. ​Thank you for partnering with us to share God’s love in our community. Thanks to a collaboration with Farmers and Hunters Feeding the Hungry (FHFH) we were able to fund the processing of three locally raised steer, that's more than 350 pounds of grass-fed beef cuts. The steer were generously donated by Keith Ohlinger of Heritage Hill Farm in Howard County. Lower in saturated fat, higher in heart-healthy omega-3 fatty acids and vitamin E, grass-fed meat is a valuable, but typically cost-prohibitive item for Manna to procure. Were it not for the support of FHFH, this quality protein would never have made it from farm to food bank. This is not Manna's first time working with FHFH. 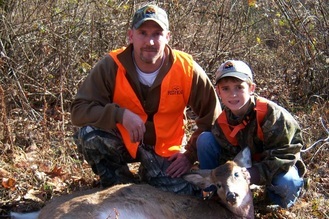 Every year hunters across Maryland harvest more deer than they can eat or share with their friends and family. Additionally, farmers are issued management permits to reduce deer numbers that are damaging their crop yields. Farmers and hunters donate their deer or livestock to inspected, approved meat processors that participate with FHFH and Manna picks up the lean protein and shares it with families we serve. On the day of this writing, we picked up over 1,200 pounds of FHFH-provided venison, enough protein for over 6,000 meals! A Manna Food Center client responded about the venison distribution: “This is the greatest find! I was super excited to see the venison in my box today. I can't wait to cook it. Thank you very much to the people who donated it. I hope this remains a staple each month in season." We want to continue to provide healthful meat options like these and FHFH is critical to that mission. Please consider supporting FHFH in their important work! 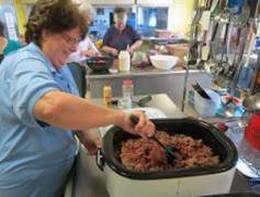 The Swannanoa Valley Christian Ministry is grateful to the Blue Ridge North Carolina FHFH chapter for the donation of 400 pounds of venison which they have been providing for a number of years. Our clients are always pleased to get meat and fresh produce. We currently have 3,300 clients who have been helped over the past four years. They need help with food, clothing, utility and medical assistance. Last year we provided more than 18,000 client services. It costs $48,000 a year to keep staples on our pantry shelves. Without community support we could not help those in need. We are so very grateful to you and Farmers & Hunters Feeding the Hungry for agreeing to pay the processing charges for deer that are donated to the Mission. On behalf of the Kokomo Rescue Mission and those we serve, than you so very much for having the heart to feed the hungry and including Howard County in this blessing. In 2014, eighteen deer were donated to the Mission. This donation means that the people who come to the Kokomo Rescue Mission will be fed good and lean meat. Thank you to Farmers & Hunters Feeding the Hungry for being the hands and feet of Jesus Christ. You have demonstrated His love and showing so many people that they are important and that they matter. Please feel free to stop by our facility and take a tour the next time you come to Kokomo. Thank you again, not only for the deer meat that we will receive, but also for showing just how great our God is. 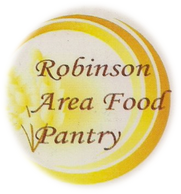 The Robinson Area Food Pantry would like to thank you for your recent donation. 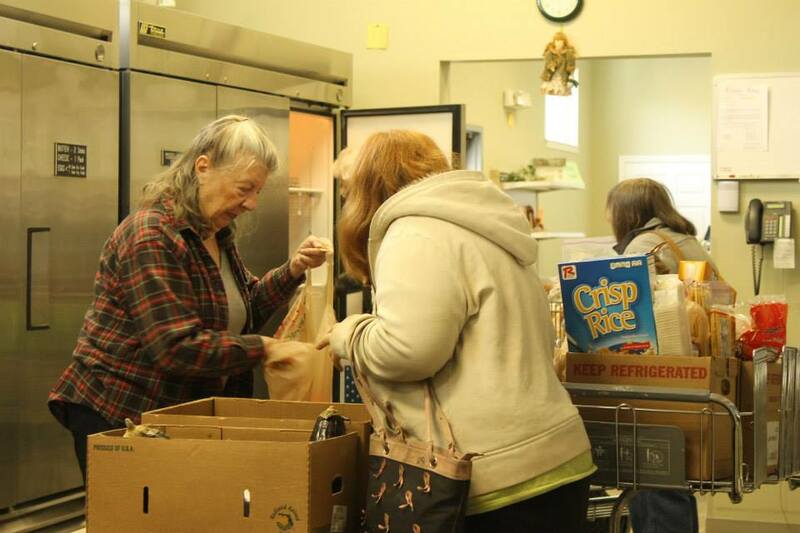 During the year 2014, the Food Pantry fed 12,407 people a total of 86,849 meals. Your donation is very much appreciated. The community’s needy persons are benefiting. It was shared that FHFH donated venison is often the only or primary source of meat that Table of Grace has to serve struggling members of the community. Thanks so much to the “Table of Grace” feeding program operating out of the Essex United Methodist Church. Our sincere thanks for the overwhelming large amount of venison brought into our St. Mary’s County. Our “Loves and Fishes” ministry at First Saints Community Church at St. Paul’s in Leonardtown, MD was a recipient. Many lives are touched and the venison was welcomed and enjoyed by those who come for a meal. We are truly grateful for this loving donation you made to this worthy cause of helping those in our community who are less fortunate. May God truly bless each of you today and always. On behalf of the staff, the volunteers, and especially the clients; we would like to thank Mr. Worman and his crew for their generous donation of venison. The smile on the clients face when they were able to receive "good meat" was contagious to the volunteers and staff. The joy spread amongst everyone. One lady, on a very high protein diet, was almost in tears to see such a generous donation made. She even said it's good people willing to help others that makes this world go round. Personally, this new fight against hunger has been a major success and blessing in the Cass County Community. Salvation Army Shelter for Women and Children gave a “shout out” on their Facebook page to Indiana FHFH for donating 400 pounds of venison to their shelter! That was a cost savings of around $3,700 for their food budget. Thank you to FHFH for this wonderful and unexpected blessing! We at Old Mother Hubbard's Cupboard thank you for the venison which you shared with us this past deer season. Last year you helped us reach an unknown goal of feeding over 12,771 people from our two sites here in Wayne County. May those who “have” share with your organization as generously as you have with ours. Sarah in Ohio donated an 8-point buck she got during muzzleloader season to FHFH to feed the hungry! Her father has donated deer to FHFH for many years. ​Thank you Sarah for caring and helping to feed the hungry! Carlee Grace, the 8-year-old daughter of a long-time Chapter Coordinator in North Carolina, is an amazing young lady. She likes the outdoors and asked her dad if she could go deer hunting with him. After watching a young deer for about an hour she decided to take a shot and donated the deer to FHFH to feed the hungry in North Carolina. In the opening weekend of Ohio's archery season, my wife and I both tagged does just minutes apart out of the same tree. We kept one for our freezer, and donated the other to FHFH (Defiance County Chapter). We will be donating any additional harvests this season to FHFH as well. On January 15th, God blessed me with an opportunity to harvest a nice buck and to help feed the hungry. It was a long shot at 53 yards, just before dark, with my Stryker Crossbow. I practiced all year for a shot like this and finally I got my chance. This buck is very special to me since it’s my first January buck ever, and my first late season donation to FHFH. I was hoping for a buck like this all season and passed on some other deer this year, but on this day I changed my mind to take what ever mature buck or doe that God could offer me to donate to FHFH. I truly believe that God always gives us what we need in all aspects of our life (it was my selfish need to get a buck). It’s not always what we want and when we want it, but it’s what we need according to God’s plan. As long as we can keep our faith and trust, God will deliver what we need when we need it. Thanks for reading my story. May God bless your life and your hunting season in 2011! 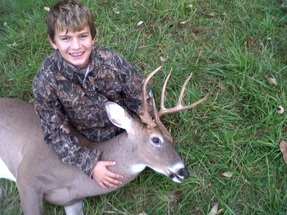 Last night in Kentucky, Noah harvested his first antlered deer! This was a deer that the property owner had on trail camera and wanted to harvest due to the odd spike on the right. This was the only deer we saw last night, and Noah put a great shot on it from 82 yards. To say Noah was excited was an understatement. He was ecstatic! As you might imagine it was very special for us to have that time together. He is still on cloud nine today. After he inspected the deer, one of his first questions was “How many people do you think this one will feed?” My answer was short, “A lot.” We weighed the deer last night at 65 pounds, so I estimated about 80 pounds of meat. Noah is looking forward to having the rack mounted and the meat donated. We know this would not have been possible without our God. 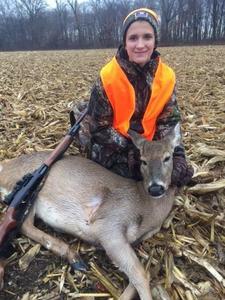 Noah said he had been praying for a buck and wondered why it had taken so long to get one. I told him that God was teaching him patience and that all things happen with God’s timing, not our own. He said that God has definitely taught him patience. A great lesson for a young boy who will be a great man, in God’s time. This season I was blessed enough to be able to take Luke's sister (Allyson) out for her first successful deer hunt! I guess it's a family tradition as she was fortunate enough to harvest her first deer and donate it to FHFH! I am truly blessed to have such great children. They both understand the compassion and stewardship that is involved in our feeding ministry, and how it correlates with hunting and harvesting; then the subsequent donation of an animal for those less fortunate or simply in need. While this was not Allyson's first hunt, she was persistent and over the course of about 5 hunts, accomplished her goal of harvesting a deer for those less fortunate. The other hunts, "non productive"? I say NO! Although we spent many hours afield this season, until this harvest, the score was deer- three, Ally- zero. I don't consider it a "waste of time." These other hunts were a great time to mentor, educate and re-connect with my daughter. You see, in this day and age of cell phones, work, busy schedules, school events and the fact that our kids are growing up too fast, I appreciate a weekend alone in a blind, just her and I sharing stories and reconnecting! All too often I see peoples’ schedules get so busy that they don't have or take the time to give one on one attention to their children. This is what they want and need; regardless of how they act or pretend to understand a parents busy schedule. And let me say one thing, while as a grown up who feels they need a weekend away, or a guy’s weekend to recharge, many kids are left alone to find their own way or things to do to keep busy. Some of these choices are not healthy ones. They aren't young forever, and sharing any experience outdoors only fosters a healthier ideal of how to spend a weekend and what one can do with their time. A friend commented, “That he could think of a dozen other things to do” rather than spend an unsuccessful weekend hunting. I would challenge that comment. While we strive for success, I feel hunting with a son, daughter or any youth interested in the outdoors, is more about the experience than the success. "As a family owned company we have always had an eye out for ways to help other families. LEM has partnered with Farmers and Hunters Feeding the Hungry (FHFH) because we believe in their mission. FHFH helps pay for donated venison to be processed and delivered to food shelters and other organizations across the country." "What better way to enlighten people on the positive role hunters play in today's society than sharing their bounty. We learned years ago from Josh Wilson at FHFH that food banks and shelters do amazing work but are almost always lacking in protein in the meals they serve. Helping your fellow man is what FHFH does and Mossy Oak is proud to have been a small part in their mission. God bless them for their tireless effort." 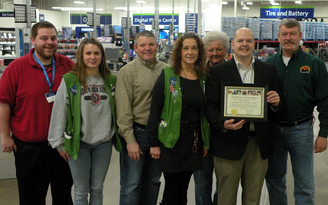 For the 5th Consecutive year, Sam's Club 6544 in Loveland, Ohio has teamed with the Southwest Ohio Chapter of Farmers and Hunters Feeding the Hungry to supply venison to local food banks and feeding ministries in Cincinnati. The Loveland Sam's Club donated $1000 through the Hunger Relief Grant program. Thank you Sam's Club! Pictured from left to right are Sam's Club associates Matt Wilkes, Sara Briggs, Southwest Ohio FHFH Coordinator Don Distler, associates Theresa Sutherland and Vickie Dosier, Sam's Club Manager Mitch Rath and Southwest Ohio FHFH Coordinator Donald Boling. FHFH North Atlanta Coordinator, Carson Saville, (center) received a $1,000 community grant from the Walmart store in Chamblee, Georgia. Special thanks to the Walmart Foundation for their local grants program that provides millions of dollars annually to local charities serving communities nationwide! ​INDIANAPOLIS, Ind. 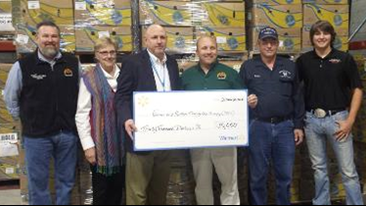 – January 22, 2016 – Today, Farmers and Hunters Feeding the Hungry (FHFH) received a $25,000 grant from the Walmart Foundation’s State Giving Program to assist with the organizations hunger relief effort in the state of Indiana. Specifically, this grant will positively impact the local community by enabling FHFH to provide nutritious meat from donated deer and livestock to feeding programs and ministries that serve the needy of the state. FHFH gives hunters and farmers in Indiana the opportunity to donate deer and livestock to over 29 participating butcher shops for processing and distribution to food banks, shelters, soup kitchens and ministries that feed the hungry. The organization raises financial support to pay the meat processing bills. Currently there are 13 local FHFH chapters in the state. The Walmart Foundation’s State Giving Program supports organizations that create opportunities so people can live better, awarding grants that have a long-lasting, positive impact on communities across the U.S.
To be considered for support, perspective grantee organizations must submit applications through the Walmart Foundation State Giving Program’s online grant application. Applicants must have a current 501(c)(3) tax-exempt status in order to meet the program’s minimum eligibility criteria. Additional information about the program’s funding guidelines and application process are available online at www.walmartfoundation.org/stategiving. As part of Walmart’s $2 billion commitment to fight hunger through 2015, Walmart donated 21.4 million pounds of food to local food banks—nearly 18 million meals in the last fiscal year in Indiana. In fact, Walmart reached $260 million in cash and $2.6 billing in in-kind donations nationwide, delivering on its commitment one year early. Additionally, just in the last fiscal year, Walmart and the Walmart Foundation gave $40 million to Indiana nonprofits. For more information on Walmart’s fight against hunger, visit http://foundation.walmart.com/our-focus/hunger. Click here to donate financially (tax deductible) to FHFH. To donate venison or livestock, click here to find a participating meat processor in your state. To find out how your corporation or organization can become a Partner with FHFH, call (301) 739-3000 or e-mail staff@fhfh.org. If you wish to volunteer your time working for FHFH, please call us at (301) 739-3000 or email us at staff@fhfh.org. Walmart and the Walmart Foundation are committed to helping people live better through philanthropic efforts. By operating globally and giving back locally, Walmart is uniquely positioned to address the needs of the communities it serves and make a significant social impact within its core areas of giving: Hunger relief and healthy eating, sustainability, career opportunity and women's economic empowerment. Walmart and the Walmart Foundation are leading the fight against hunger in the United States with a $2 billion commitment through 2015. Walmart has donated more than 1 billion meals to those in need across the country. To learn more about Walmart's giving, visit foundation.walmart.com. 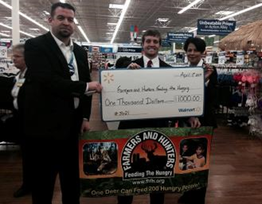 Farmers and Hunters Feeding the Hungry (FHFH) received a $30,000 grant from the Walmart Foundation. Through this grant, the FHFH will be able to provide additional protein-rich meat to people in need across North Carolina. “We are deeply appreciative of this support from the Walmart Foundation for North Carolina FHFH Chapters. An estimated 70,000 additional servings of nutritious meat to the hungry of North Carolina will allow us to expand the number of food relief groups and organizations served,” said Matt Wilson, FHFH Program and Development Director. The donation totals received by existing and potential new FHFH chapters can be increased greatly by approximately 350 deer this fall and winter season. The funding support from the Walmart Foundation will also aid in the recruiting of new local program coordinators and qualified meat processors to participate with FHFH in the effort to feed the hungry of North Carolina. Walmart and the Walmart Foundation are committed to helping people live better through philanthropic efforts that draw on the strengths of Walmart in the arenas of sustainability, economic opportunity, and community. As part of our commitment to creating a more sustainable food system worldwide, Walmart and the Walmart Foundation are leading the fight against hunger in the United States. They recently exceeded a $2 billion goal to fight hunger one year ahead of schedule and have donated more than 1.5 billion pounds of food to those in need across the country. To learn more about Walmart’s giving, visit www.foundation.walmart.com. John and Beth Mollet have been volunteer coordinators for FHFH since 2005. Their chapter, Central Indiana FHFH, serves Hamilton, Marion, Hancock, Henry and Madison counties. "Knowing that we've provided for hungry people is the most rewarding, children in particular. We both have a heart for the child and the elderly, and there are a lot of people out there that don't have food," John said. "Stats say one in five children go to bed hungry, and feeding hungry people is the most rewarding thing." 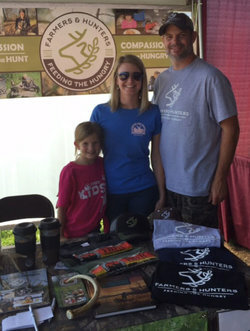 Matt Coblentz, our new Chapter Coordinator for Lehigh Valley FHFH in Pennsylvania, was "blown away" when his wife Kelly and daughter Julia asked to help him out at the Lehigh Valley Hunting and Fishing Expo! Kelly told him they wanted to help because "FHFH is a family ministry. It fits what we all love to do!" Ken Worman, Coordinator for Cass County FHFH in Indiana says, “This is what makes being a part of such an awesome Christian Organization (FHFH) so special and rewarding; the feeling you get helping God to feed His people is so unbelievable. I am so blessed just being a part of FHFH. We don't realize how well we have it, until you go visit a pantry or mission. Being such a small piece of the puzzle can make your heart and mind feel so huge. God bless all of the FHFH staff, the coordinators, deer processors, pantries and all people involved in helping to feed our hungry in the greatest nation of all - the USA." Sharing A Passion for God and the Great Outdoors! Tim Fisher, Co-Cordinator for Southwest Ohio FHFH, says "I enjoy being an FHFH coordinator because it brings me closer to people like myself who share a passion for God and the great outdoors. Furthermore, I believe there comes a time in every hunters life that they have a desire to give back. FHFH does just that, and actually sheds positive light to the minds of the anti and non-hunting public. It's such a rewarding feeling to help others and not just ourselves!